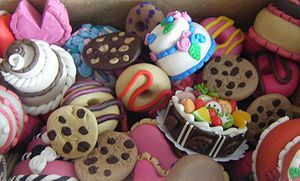 Pas Haba BeKisnin is a Talmudic term used to describe a certain type of snack food and in general this includes most of our cakes and cookies. The Bracha for these types of foods depends on whether it's eaten as a snack or a meal. For the precise definitions and laws see further. For background see footnotes. 3 What is Pas Haba Bikisnin? If one eats Pas Habah Bekisnin as a snack one should make Mezonot for Bracha Rishona and Al HaMichya for Bracha Achrona and if one eats Pas HaBah BeKisnin as a meal one should make HaMotzei and Birkat HaMazon. The precise definition of a meal for this halacha is discussed in the next section. NOTE: This next section is assuming that the shiur keviyut seuda is 8 kezayitim, which is true for sephardim, however, for ashkenazim it's different. 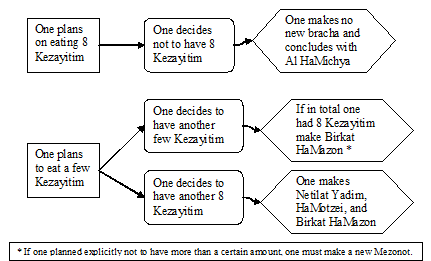 If one made a Mezonot thinking that one was only going to have a few Kezayitim and then changed his mind to end up having 8 Kezayitim, if one plans on having another 8 Kezayitim one should stop and wash with a bracha and make HaMotzei. What is Pas Haba Bikisnin? The bread is filled with a sweet filler such as: chocolate, nuts, fruit, etc. According to Sephardim, if the taste of the sweeteners is recognizable in the dough, then the Bracha is mezonot. Even if the majority is sweeteners in comparison to the water unless the taste is recognizable the bracha is Hamotzei. If a food is made with 100% apple juice according to some Ashkenazic poskim it is still hamotzei. According to many poskim to be considered pat haba bikisnin, the filling must not be a “meal” food, for example meat, fish, cheese, or vegetables (unless the pastry is clearly made to be eaten as a snack). If it was filled with cheese or meat according to Ashkenazim if the food is always eaten as a snack the bracha is mezonot, but if it is eaten as a meal type food it is mezonot. According to Sephardim it is hamotzei. Pita chips are hamotzei since they were made to be a bread first and the leftover pitas are made into chips. Most poskim hold that noodle kugel is considered a cooked mezonot and would always be mezonot even if one had a meal of it. However, some say that it is considered a baked mezonot and could become hamotzei if eaten as a meal. See also Bracha on Bagels. A similar discussion could be had of lasagna. However, in conclusion the bracha is mezonot. The Bracha on wraps and tortillas is HaMotzei. Some say that cereals made from the 5 grains are considered Pas HaBah Bekisnin which if one ate "enough to establish a meal" one would say HaMotzei and Birkat HaMazon, others, however, hold that cereal is not made with the look of bread and remains mezonot even if one ate "enough to establish a meal". Some say that pancakes are always mezonot even if one has a meal of them since they are made with a liquid batter that spreads out when poured. Soft pretzels according to some are hamotzei. Some hold that it is mezonot. In a technical sense it isn't considered absolving oneself of a mitzvah to make bread into Pat Haba Bkisnin in order not to wash. If the last day of Pesach falls out on Friday, then the bracha on Matzah for the Shabbat immediately following Pesach is Hamotzei. ↑ What’s the Bracha on Pas HaBah Bekisnin? The opinion of Rav Nachman and Shmuel in Gemara Brachot 42b is the Bracha on Pas HaBah Bekisnin is Mezonot when eaten as a snack and HaMotzei when eaten as a meal. Rashi (Brachot 41b s.v. Pas) and the Rif 30a holds that if one eats Pas HaBah Bekisnin as a snack there’s either no Bracha Achrona at all or there’s only a Boreh Nefashot (see Rabbenu Yonah’s (29b s.v. Trisar) two explanations of the Rif and Tosfot’s (D”H Elah) explanation of Rashi). However, Tosfot (41b s.v. Elah) explains that the Bracha Achrona on Pas HaBah Bekisnin is Al HaMichya (if one doesn’t make it into a meal). The Rosh 6:30, Rashba s.v. Rav Huna, and Rambam (Brachot 3:9) agree with Tosfot and the Tur and S”A 168:6 codify this as halacha that for a snack one makes Mezonot and Al HaMichya and a meal one makes HaMotzei and Birkat HaMazon. What is considered a meal? The Bet Yosef 168:6 quoting the Shibolei HaLeket (Siman 159), Magen Avraham 168:13, and Chaye Adam 54:14 in name of the Gra hold that the amount of meal for this halacha is the amount people normally eat at a regular meal in the morning and evening. (Mishna Brurah 168:24 and Shaar HaTziyun 19 also quote the Sefer Eshkol and Shagat Aryeh). However, the Birkei Yosef 168:4 and Kaf HaChaim 168:45 argue that the amount of a meal in this context is the same as a meal for Eruv Chatzerot which is either 3 or 4 KeBaytzim. Some authorities (Machatzis Ha’shekel S”A O.C. 168:13) derive it from the halacha of eiruv t’chumin (4 eggs), and some (S”A Harav 168:8) maintain that a “normal meal” should be calculated according to the manna that the Jews ate in the desert (21 eggs). Ashkenazim: Most poskim (Gra 168, Mishna Brurah 168:24, Igros Moshe O.C. 3:32) maintain that the amount is measured by the normal eating habits of each country. The Mishna Brurah 168:24 rules that the halacha follows the opinion that a meal is considered by a regular meal people eat but adds that it's proper to be strict for those who are strict to require 4 KeBaytzim (meaning, that preferably one should only eat less than 8 Kezayitim or more than the amount of a regular meal, Vezot HaBracha pg 29). VeZot HaBracha (chap 4, pg 31) writes that according to his calculation for a regular person for regular cake if one eats less than 230 grams that is considered a snack, if one eat more than 280 grams that is certainly a meal. He continues that if one did eat in between 8 Kezayitim and a certain meal, if one is not full make Al HaMichya and if one is full make Birkat HaMazon, yet, in such a case it’s preferable to hear Birkat HaMazon (from someone who’s obligated to make Birkat HaMazon) or to eat bread (making HaMotzei and Birkat HaMazon). Halachos of Brachos (Rabbi Bodner, chap 27, pg 488-9) agrees to the above halachot and adds that if one wishes to have more than 8 Kezayitim and less than the amount of a regular meal one may do so but one should first wash and make Hamotzei on a Kezayit of bread. Sephardim: Halacha Brurah 168:16 (explained in Otzorot Yosef Siman 9) writes that Sephardim hold like the Chida that if one ate 8 Kezayitim one should make HaMotzei and Birkat HaMazon, and if one ate less than that one should make Mezonot and Al HaMichya but it's preferable that one shouldn't eat in between 6 and 8 Kezayitim. This is also the ruling in Ben Ish Chai Pinchas 19, Kaf Hachayim 168:45, Sh"t Shemesh U'magen 2: hashmatot page 318, and Chazon Ovadia Berachot page 56. ↑ Chazon Ovadia Berachot page 55, Sh”t Shemesh Umagen 2:11:page 29, Kaf HaChaim 168:47 rules against the Magen Avraham 168:13 and says that S”A implies that one must be the amount of a meal from the Pat itself. Magen Avraham 168:13 writes that if one eats Pas HaBah Bekisnin with other foods then all the food are counted towards the amount of a regular meal. This is quoted as halacha by Mishna Brurah 168:24, Chaye Adam 54:4, Halachos of Brachos (chap 27, pg 490-1), and Vezot HaBracha (chap 4, pg 32-6). What is the minimum amount of bread needed? Igrot Moshe 3:32 and 4:41 writes that the Pas HaBah Bekisnin combines with the other food even if one ate less than 3 KeBaytzim. [Halachos of Brachos (chap 27, pg 490, note 28) writes that this is implied by Mishna Brurah.] Vezot HaBracha (chap 4, pg 32, note 10) writes that Rav Pinchas Sheinburg agreed with Igrot Moshe and both agree that the minimum Pas HaBah Bekisnin needed is one Kezayit. However, S”A HaRav 168:8 writes that the other foods only combine when one eats at least 4 KeBaytzim. Halachos of Brachos (chap 27, pg 490, note 28) quotes Rav Shlomo Zalman Auerbach who said that one may be lenient to rely on this opinion. Vezot HaBracha (chap 4, pg 32, note 10) writes that Rav Pinchas Sheinburg agreed with Igrot Moshe but in conclusion he quotes Rav Elyashiv who said that one should avoid this dispute. Which foods combine with Pas HaBah Bekisnin? Mishna Brurah 168:24 implies that only foods that are normally eaten as a sandwich with bread combine with the Pas HaBah Bekisnin. Halachos of Brachos (chap 27, pg 490, note 28.1) quotes Rav Shlomo Zalman Auerbach who agreed with this approach. However, Igrot Moshe 3:32 rules that any food with is normally eaten ate a meal combines with Pas HaBah Bekisnin. Which Pas HaBah Bekisnin combines with other foods? Halachos of Brachos (chap 27, pg 490, note 29.1-29.2) quotes a dispute between Rav Shlomo Zalman who holds that only Pas HaBah Bekisnin which is used as a bread substitute (such as egg matzah or crackers) combines with other foods whereas Igrot Moshe 3:32 seems to argue that any Pas HaBah Bekisnin combines with other foods. Halachos of Brachos (addendum 2, B, pg 261, note 6.1) quotes Rav Yacov Kamentsky that Pas HaBah Bekisnin doesn’t combine with other foods unless than food is eaten together with the other food (in a sandwich). Vezot HaBracha (chap 4, pg 32) quotes Rav Pinchas Sheinburg who agreed with this and Rav Shlomo Zalman who wasn’t certain about it. Then he quotes Rav Elyashiv and Rav Moshe (Igrot Moshe 1:56) who hold that Pas HaBah Bekisnin combine with the other foods whether or not the other food is eaten with the Pas HaBah Bekisnin or not. The Magen Avraham introduced the idea of having other foods count toward the amount of a meal when eaten with Pas HaBah Bekisnin. There’s four limitation of this idea. (1) Some say that there needs to be a minimum of 4 KeBaytzim in order for the other foods to combine. (2) Some say that only food that if normally eaten on bread (such as meat) combine. (3) Some say that only Pas HaBah Bekisnin that is normally used as a bread substitute combines with other foods. (4) Some say that the food only combines when it’s eaten on bread. However, all four limitation are subject to dispute. Regarding dispute 1 and 2, Vezot HaBracha (pg 33, note 11) writes that after the fact if one ate in between 1 and 8 Kezayitim, or even if one ate 8 Kezaytim of Pas HaBah Bekisnin but the other food one ate doesn’t normally accompany bread (such as rice) one should make Al Hamichya but in the latter case it’s preferable to hear Birkat HaMazon from someone else (who is obligated to make Birkat HaMazon) and fulfill the obligation through Shomea KeOneh. Regarding dispute 3, Halachos of Brachos (chap 27, pg 491, note z) siply quotes the dispute but doesn’t legislate. Regarding dispute 4, The Vezot HaBracha (pg 33, note 11) concludes that one can make HaMotzei and Birkat HaMazon if one eats 8 Kezaytim of Pas HaBah Bekisnin with food that would normally be eaten with Pas HaBah Bekisnin and was full from everything together (seemingly ignoring this dispute). Vezot HaBracha (chap 4, pg 32) writes that because of all the disputes one should avoid eating the amount that people normally would become full on, or first eat bread and make HaMotzei or use the next suggestion. Vezot HaBracha writes that one may eat the Pas HaBah Bekisnin first, make a Bracha Achrona, and then eat the other foods, or eat the other foods, make a Bracha Achrona, and then eat the Pas HaBah Bekisnin. By doing this the Pas HaBah Bekisnin certainly doesn’t combine with other foods to be considered a meal. However, this suggestion doesn’t apply when the other foods are Mezonot because by making a Bracha Achrona in the middle one will have made a Bracha unnecessarily. Vezot HaBracha (pg 33, note 12) writes that the first option of having the Pas HaBah Bekisnin followed by the other food is preferable to the second option because everyone agrees to the first option whereas the second one is subject to dispute but may be employed in a case of a certain need. ↑ The Kaf HaChaim and Sh”t Korban Eshe write that one needs to have all of the 4 Kebayitzim in one Kedi Achilat Pras. However, Yalkut Yosef (Birkat HaMazon pg 130) writes that the strict halacha only requires that one have one Kezayit in a Kedi Achilat Pras. Vezot HaBracha (Chapter 4, pg 27) agrees with Yalkut Yosef. ↑ Sh”t Igrot Moshe O”C 2:54, Yalkut Yosef (Birkat HaMazon pg 137). ↑ Mishna Brurah 168:25 writes that if one changed one’s mind one doesn’t make a new HaMotzei if one doesn’t plan on eating more than 8 Kezayitim. Mishna Brurah (Shaar Tzion 168:21) writes that one shouldn’t make a new Mezonot unless one clearly changed one’s mind such as if when he started he thought that he will not eat more than a certain amount, however, if one didn’t clearly retract his opinion then one doesn’t make a new Mezonot. ↑ Rambam Hil. Brachot 3:9, Rashi (Brachot 42b s.v. Pas) explains that Pas HaBah Bekisnin is a cake which was made from a dough that was kneaded with spices. ↑ Rama 168:7. Mishna Brurah 168:33 writes that the minhag of Ashkenazim is to recite mezonot on any cake that has a majority of sweet ingredients compared to the water. That is, the juice or oil as a part of the total liquid ingredients has to me less than 50%. ↑ Chazon Ovadia (Brachot p. 60) writes that the criteria for Sephardim is whether the taste of the sweeteners is recognizable whether or not there is a majority of sweeteners or not. This is in opposition to the opinion of the Daat Torah 168:7 who writes that if there is a majority of sweet fruit juice in comparison to the water it is mezonot even if the taste isn't recognizable. Therefore, Chazon Ovadia concludes that pizza made with milk and water is hamotzei unless the milk is tasted in the dough. Halacha Brurah 168:22 agrees. ↑ Shulchan Halevi p. 299 writes that mezonot breads made from 100% apple juice and no water even if the juice isn't from concentrate it is still hamotzei since the apple juice doesn't have a strong taste and is like water. ↑ Shulchan Aruch O.C. 168:17 writes that dough baked with meat or cheese is considered hamotzei. The achronim ask why it isn't considered pat haba bkisnin. The Taz 168:6 in fact concludes that it should be pat haba bkisnin. However, the Magen Avraham 168:44 suggests that perhaps dough filled with a sweet filling is considered mezonot but dough filled with a meal type food such as cheese or meat makes the resulting food hamotzei. The Mishna Brurah (Biur Halacha 168:17 s.v. pashtida) makes a compromise; if the resulting dough with cheese or meat is considered a snack it is mezonot but if it is a meal type food it is hamotzei. Vezot Habracha ch. 3 p. 20 agrees with the Biur Halacha. Chazon Ovadyah Brachot, pg 60-1, Or Letzion 2:12:5, and Birkat Hashem (vol 2, 2:62) rule like the Magen Avraham. See Ben Ish Chai Pinchas 20 and Halacha Brurah 168:49-50 who are concerned for the Taz. ↑ Shulchan Aruch 168:7. Vezot HaBracha (pg 19, chapter 3) points out that the Mishna Brurah (168:35) writes that it must be that it's usual to be eaten as a snack. ↑ Vezot HaBracha (Chapter 4, pg 26). There he mentions that majority of poskim hold that kugel is Tavshil Mezonot and similarly concerning wafers there’s some doubt in the poskim even though the primary halacha is that it’s Tavshil Mezonot. Halacha Brurah 168:28 writes that blintzes and crepes are so thin that they are mezonot even if eaten as a meal. ↑ Regular noodles are certainly mezonot because they doesn't resemble bread since it is so thin and boiled (Rama 168:13). The only question is if it is later baked whether that makes it into pat ha'ba be'kisnin, which becomes hamotzei if eaten as a meal, or it remains a tavshil mezonot, which is mezonot even eaten as a meal. Noodle kugel is such an example of noodles that are boiled and then baked. Or Letzion 2:12:6 writes that noodle kugel is mezonot and remains a non-bread mezonot since it is still a thin dough and doesn't resemble bread. Additionally, Vezot Habracha (Birur Halacha 5, p. 218) quotes Rav Shlomo Zalman, Rav Sheinberg, and other poskim who consider noodle kugel to be a tavshil mezonot. Rav Shlomo Zalman added that it should remain a tavshil mezonot since the noodles are still recognizable. Additionally, Shaarei Bracha (p. 146) explains that it is a tavshil mezonot since it is fully cooked before it is baked. However, Rav Elyashiv is of the an opinion (quoted by Vezot HaBracha) that noodle kugel is a pat habah bekisnin since it is baked. His proof is the Mieri (Pesachim 36b s.v. iysa) who says that bread which is boiled and then baked is hamotzei. ↑ Lasanga seems to have the same status as noodle kugel. In any event, Vezot HaBracha (Birur Halacha 5, p. 219) writes that the bracha on lasagna is mezonot since it doesn't resemble bread. He writes that even if it isn't boiled beforehand, it is mezonot since it doesn't resemble the look of bread at all. Though there may be a variety of different wraps and wheat-tortillas, this discussion will focus on the common wrap and tortilla, that is a flatbread usually rolled around a filling of meat, salad, or the like (as displayed in the picture to the right). Is there a difference between wraps and wheat-tortillas? From my research, the answer is no. They are two names for the same food. Wheat or flour tortilla is the Mexican name for the food, whereas wrap is the American alternative. To support this point, see Wikipedia on Wraps and remezcla on the difference between wraps and tortillas. How are wraps and tortillas made? From several accounts, it seems clear that wraps and tortillas are made from a thick dough that is rolled out and cooked in a frying pan without oil or with a minimal amount. The wheat flour is always the primary ingredient and there is also water or a substitute, such as milk. To prove this point, see a Wikihow article, another Wikihow article, or a video on cooking-mexican-recipes. In terms of the bracha, a few factors should be considered. 1) The ingredients other than flour and water and 2) The thinness of the wrap or tortilla. In terms of the other ingredients, the issue to consider is whether the wrap becomes Pat Haba Bikisnin because of those ingredients. According to Sephardim, following Shulchan Aruch 168:7, if the flavor of the milk, oil, or the like can be tasted and makes it taste significantly different from bread, the bracha would be mezonot. According to Ashkenazim, following Mishna Brurah 168:33, only if there was a majority of ingredients in comparison to the amount of water would the bracha be mezonot. For more on this issue, see above. Baking vs Frying: Shulchan Aruch 168:13 writes that thick dough which was cooked or fried is mezonot, but some disagree and hold that it is Hamotzei. Rama 168:14 comments that if one fries bread in a pan without any oil or with just enough oil to prevent it from burning, it is considered like baking and the bracha would be Hamotzei. Accordingly, wraps and tortillas are considered as though they are baked. Crackers: Shulchan Aruch 168:7 quotes the opinion of Rav Hai Goan that flatbread that is hard, dry, and cracks is mezonot. This is simply not applicable to wraps or tortilla. Thin Form: In the other extreme, Shulchan Aruch 168:8, explained by the Mishna Brurah 168:36, writes that regular soft bread made from dough is HaMotzei even if it is made into a thin form. For example, pita is Hamotzei even though the shape is thin (Vezot Habracha p. 395). The next section we address the thinness of the batter. Thin Batter vs Liquid Batter: The Rama 168:14 writes that bread which was made from thin batter, which was baked in the oven, is Hamotzei. On the other hand, Shulchan Aruch 168:8 writes that bread (lachmaniyot) made with a thin batter is mezonot. The Magen Avraham 168:20 answers that Shulchan Aruch only meant that it is mezonot if the batter is very thin. For example, the Bach 168:8, Magen Avraham 168:20, and Mishna Brurah 168:37 write that blintze dough is mezonot because it is made with very thin batter. To clarify, Mishna Brurah 168:37 explains that very thin batter is something that pours and is a similar consistency to porridge. Difference of Shape: Shulchan Aruch 168:15 writes that batter that is poured into a pan, shaped like a bowl, over the fire would have the bracha of mezonot but would be Hamotzei if one were to eat it as a meal (Koveh Seudah). If the batter is poured over an inverted pan, shaped like a bowl, over the fire, the bracha would be mezonot even if one were to eat it as a meal. The Magen Avraham 168:40 explains that both of these cases are speaking about very thin batter, otherwise they would be Hamotzei. See the Beiur Halacha 168:15 s.v. Kemach who challenges the Magen Avraham. Semi-Thick Liquid Batter vs Extremely Thin Batter: Breads made from a very thin batter are mezonot, however, if one eats it as a meal (Koveh Seduah) the bracha becomes HaMotzei (Shulchan Aruch 168:8). Yet, if the batter is extremely thin, thinner than that of blintzes (a semi-thick liquid), when poured out it spreads out quickly and forms a very flimsy dough, then the Bach 168:8 writes that the bracha is mezonot even if one eats it as a meal. For example, he says that wafers have such a consistency. This is quoted by the Magen Avraham 168:40 and Mishna Brurah 168:38. Conclusion: If wraps and tortillas are made with a thick dough it seems that the bracha should be Hamotzei even if it has a thin shape. An article on ykr.org.il quotes Or Torah (Iss. 552, 5773 Tamuz 118:17) as saying that wheat tortilla is Hamotzei. Similarly, Kipa.co.il writes that the bracha on wraps is Hamotzei (repeated here as well). The same can be found on toraland.org.il. The OU Guide to Brachos writes that wraps are Hamotzei when eaten together with the filling but otherwise are mezonot. See there for the reasoning. ↑ Vezot HaBracha (pg 26, chapter 3). Halachos of Brachos (pg 527-8, not 7) quotes Rav Shlomo Zalman saying that breakfast cereals from the 5 grains is tzurat hapat Halachically Speaking quotes Vezot HaBracha (192 or 219) quoting Rav Shlomo Zalman and Rav Elyashiv that cheerios is tzurat hapat and Rav Chaim Pinchas Sheinburg disagrees. ↑ An article from the OU quotes Rav Schachter and Rav Belsky as saying the Cheerios does not have tzurat hapat because of its small size and the way it is dried (original article can't be found online and what is linked is a shortened version). Rav Schachter (YUTorah Brachot Shiur 70 min 45) explained his opinion. Rav Shlomo Miller, Rav Gedalia Shwartz, and Rabbi Mordechai Willig in a shiur on yutorah.org (min 59) agree that Cheerios do not have tzurat hapat. ↑ Or Letzion 2:46:10 writes that toast is considered like regular bread and is hamotzei since it started as regular bread. Vezot Habracha ch. 3 p. 20 agrees. ↑ The Shulchan Aruch 168:10 writes that bread that was cooked or fried is still hamotzei if the pieces were larger than a kezayit. Therefore, Vezot HaBracha (Chapter 3, pg 20,21,23) and Rav Schachter (Brachot Shiur 70 min 85) ruled that french toast is certainly hamotzei. Shulchan Aruch 168:7 rules that when one eats Pas HaBa BeKisnin as a snack the Bracha Rishona is Mezonot and Bracha Achrona is Al HaMichya, however, if one makes a meal out of it the bracha is HaMotzei and Birkat HaMazon. Shulchan Aruch 168:8 gives three definitions of Pas Haba BeKisnin and the last one is a hard dry baked goods. [There is a dispute about how to explain why dry bread should be Mezonot. Some say that the reason is that since it is made as a snack and not as a meal food the bracha is Mezonot (Bet David quoted by Sedei Chemed "Brachot" 1:10). Others say that because it is very hard it's unlike regular bread and so the bracha is Mezonot (Aruch HaShulchan 168:21). Melba toast is a type of cracker made from regular bread which is toasted. Some say that since it was made a regular bread it is HaMotzei and toasting bread isn’t one of the ways which changes the status of bread (See 168:10). This is the opinion of the Laws of Brachos (Rabbi Forst, chap 8, pg 239) and the Star K.
However, others argue that since it was made from the beginning with the intent to make it into a snack type food which is hard and dry like a cracker the Bracha is Mezonot even though it started out as real bread. This is the opinion of Halachos of Brachos (Rabbi Bodner, chap 26, pg 467) and Vezot HaBracha (chap 3, pg 21 and Birur Halacha 39). ↑ S”A 168:17 rules that bread filled with meat or fish has the Bracha of HaMotzei. Magen Avraham 168:44 explains that this Bracha is made even if one doesn’t have a keviyut sueda because regarding sweets that fill the bread such as fruit there’s room to say that such fillers make the bread into a temporary snack, however, a substantial filler such as meat, fish, or cheese don’t make the bread change from HaMotzei to Mezonot. This is also the opinion of the Mishna Brurah 168:94 and Yalkut Yosef (Brachot pg 125, Kitzur S”A 168:3). However, the Taz 168:20 argues that for filled bread the Bracha is Mezonot like in Shulchan Aruch 168:7 unless there’s a keviyut sueda. [Interestingly, the Ben Ish Chai (Pinchas 20), Kaf HaChaim 168:137, and Halacha Brurah 168:49 are concerned for the opinion of the Taz and hold that one should make sure to have more than a keviyut sueda, however if one doesn’t have enough and one doesn’t have bread, one should make a mezonot.] The VeZot HaBracha (pg 17 note 1) rules like Mishna Brurah that for bread that’s filled and is meant to fill one up the bracha is HaMotzei. ↑ Pri Megadim (E"A 168:39) writes that pretzels are hamotzei. Historically, pretzels were soft pretzels (https://en.wikipedia.org/wiki/Pretzel#History). Kaf Hachaim 168:59 quotes the Pri Megadim. ↑ Rabbi Forst (Laws of Brachos p. 238) writes that soft pretzels made with water might be hamotzei. The reason he is unsure is because they are made as a snack and some poskim hold that anything which is generally eaten as a snack is mezonot. This point is discussed at length in Kaf Hachaim 168:120 who concludes that it doesn't depend on whether it is usually eaten as a snack if it doesn't fit into the definitions of the rishonim. ↑ Vezot HaBracha (pg 19, chapter 19 and pg 386) in name of Rav Elyashiv, Rav Nissim Karelitz, and Or Letzion (Vol 2, 12:4). Many American rabbis ruled that the bracha is HaMotzei including Rabbi Avraham Bik, Rabbi Reuven Feinstein, Rabbi Moshe Heinemann, Rav Moshe Shtern, Rabbi Yisrael Belsky, Rabbi Avrham Bloomenkrantz, and Veten Bracha (Halachos of Brochos by Rabbi Bodner pg 498-9, chapter 27) in name of Rabbi Shlomo Zalman regarding America. ↑ http://www.oukosher.org/index.php/common/article/the_mezonos_roll_is_it_a_piece_of_cake_by_rabbi_yaakov_luban/ is the OU's position based on a Teshuva of Rabbi Yisrael Belsky which is that if a Mezonot roll is eaten as part of the meal the bracha is HaMotzei, see Making a meal on Mezonot. This is also the opinion of the Star-K http://www.star-k.org/kashrus/kk-issues-pashabah.htm. ↑ Kaneh Bosem 3:10 explains that Brachot are a mitzvah relevant to the person and therefore there is no issue with making bread into something that is mezonot. He distinguishes it from Challah which is forbidden to make in some proportions in order to absolve oneself of the mitzvah to take Challah. That is a mitzvah that emanates from the dough itself. He also cites Tosfot Brachot 37b s.v. amar in which the practice of Rabbenu Dovid to make mezonot bread in order to rush to shiur is recorded. Shulchan Aruch 168:17 rules that bread filled with meat or fish has the Bracha of HaMotzei. The Magen Avraham 168:44 explains the Bracha is HaMotzei as a filling of meat, fish, or cheese doesn’t change the Bracha on bread and only if there’s a sweet filler such as fruit is it considered Pas HaBah Bekisnin. However, the Taz 168:20 holds that for filled bread the Bracha is Mezonot just like if it was filled with sweets unless one eats a keviyut sueda. The Mishna Brurah 168:94 and Beiur Halacha s.v. Pashtida rules a compromise that if it's normal to eat the bread filled with meat to satisfy hunger and fill one up the bracha is Hamotzei, however, if there's pieces of meat mixed in and it's recognizable that it's meant as a dessert the bracha is Mezonot. Rabbi Ovadyah Yosef (Chazon Ovadyah Brachot, pg 60-1, Halichot Olam vol 2 pg 114, and Sh”t Yabia Omer 9:108(84)) rules like the Magen Avraham and that the Bracha on pizza is Hamotzei. This is also the opinion of Yalkut Yosef (Brachot pg 125, Kitzur S”A 168:3), Chacham Ben Tzion Abba Shaul in Or Letzion (vol 2, 12:5), Rav Shmuel Pinchasi in Minchat Shmuel 1:11, and Rabbi Moshe HaLevi in Birkat Hashem (vol 2, 2:62). Halacha Brurah 168:49-50 is concerned for the opinion of the Taz, however, he concludes it is Hamotzei, but it's preferable to have it in a meal or have more than a keviyut sueda to satisfy all opinions. ↑ VeZot HaBracha (pg 21) quotes Rabbi Shlomo Zalman Auerbach, Rabbi Pinchas Sheinburg, and Rabbi Moshe Shternbach that the Bracha on pizza (which is made from water and flour) is HaMotzei. Veten Bracha (Halachos of Brochos by Rabbi Bodner pg 499-500, chapter 27) quotes Rav Shlomo Zalman Auerbach as saying that in America where some people eat it as a snack, it depends on each person's intent. Rabbi Chaim Jachter quotes Rav Moshe Feinstein as being reported as saying that one slice of pizza is Mezonot and even says that it seems that the minhag is like this opinion. Rav Shmuel Pinchasi (Sefer Minchat Shmuel (vol 1, siman 11, pg 73) also quotes this opinion of Rav Moshe and differentiates that the Bracha on pizza in Israel would be Hamotzei. Rav Yisrael Belsky (Mesorah (1989, vol 1, pg 40-1)) writes that the minhag to make Mezonot on pizza has what to rely on unless a person has it as a meal. Halachically Speaking (2007, vol 3, issue 26) quotes Rav Belsky as saying that the minhag is to make Mezonot on pizza unless they eat a shiur of keviyut seudah. This is also the position of the Pizza and Kevias Seuda.pdf Kof-K. This also seems to be the opinion of Rav Dovid Feinstein see TheYeshivaWorld.com. Similarly, the Star K writes that one slice is certainly a snack, three is certainly a meal, and two is questionable but if one eats it with a side dish then it would be considered a keviut seudah and one should make HaMotzei. ↑ Rav Mordechai Willig (Am Mordechai page 99) rules that even in America the bracha is HaMotzei. Rabbi Chaim Jachter quotes Rav Zalman Nechemia Goldberg and Rav Hershel Schachter as having ruled that one slice of pizza is HaMotzei. (Rabbi Jachter also quotes Rav Belsky as ruling that it was Hamotzei, however, see above sources that write the opposite in the name of Rav Belsky.) This is also the opinion of the OU that pizza is Hamotzei. Pitchei Halacha (Laws of Brachos by Rabbi Binyamin Forst pg 235) finds a very hard time justifying making a Mezonot on one slice but says that if one has pizza as a meal one should certainly make HaMotzei. ↑ Vezot HaBracha (pg 22) writes in name of Rav Elyashiv and others that the status of such pizza is in doubt and so one should eat it in a meal or eat a Shuir Sueda which the Vezot HaBracha writes is 2 slices. ↑ Vezot HaBracha (pg 20), Tzitz Eliezer 11:19. Shevet Halevi 1: in the footnotes to SA 168:8 says one should be machmir and eat as part of a meal. Rav Tzvi Pesach frank Sh"t Har Tzvi OC 91 says on the small matza-like crackers to say mezonot, and only say hamotzi if you are kovea seuda on matza. ↑ Chazon Ovadia Berachot page 61, Sh"t Yechave Daat 3:12, Sh"t Shemesh U'magen OC 1:34. This is in accordance with the definition of the Aruch s.v. Kesen, quoted by Bet Yosef 168:8 quoting Rav Hai Gaon that pat haba bikisnin is a hard, cracker-like bread, quoted in SA 168:8. ↑ Vezot HaBracha (Chapter 3, pg 20), Yalkut Yosef (Kitzur S”A 168:4), Chazon Ovadyah (Brachot pg 61), Sh"t Yechave Daat 3:12, Chida in Machazik Beracha 158:5. ↑ Vezot HaBracha (chap 3, pg 18) based on Mishna Brurah's 168:33 explanation of the Rama 168:7. ↑ Kaf HaChaim 168:58, Or Letzion (vol 2, 12:4), Chazon Ovadyah (Brachot pg 55) based on Shulchan Aruch 168:7 rule that sweet challah is mezonot if one can taste the sweetness in the challah. Birkat Hashem (Rav Moshe HaLevi vol 2, 2:40) agrees that sweet challah is Mezonot but argues that the amount of a regular meal isn't 6 or 8 Kezaytim but rather a little more than 2 Kezaytim and so if one eats more than 2 Kezaytim of sweet challah one should make HaMotzei. However, if it's made with a minority of water or no water then he agrees that the amount of a regular meal is 170cc (6 Kezaytim). ↑ Vezot HaBracha (Chapter 4, pg 39) in name of Rav Mordechai Eliyahu and Rav Elyashiv paskening for Sephardim ruled that, ideally, one should eat 8 Kezayitim of the challah in order to be able to make HaMotzei and Birkat HaMazon, however, if that’s difficult one should have 6 Kezaytim and if that’s difficult there’s what to rely on to make a HaMotzei and Birkat HaMazon even if one only eats one Kezayit of the sweet Challah. Vezot HaBracha also quotes this from Rav Shlomo Levi in Kuntres Birkat HaPat pg 43. The reasons given for this ruling is: (1) this definition of Pas HaBah Bekisnin is only one of three (S”A 168:7) and perhaps according to the other opinions it’s real bread. (2) Also, according to the Rama’s 168:7 explanation of this definition the Bracha would be HaMotzei. (3) Lastly, according to the Bet Yosef since this sweet challah is used regularly for a meal the Bracha would be HaMotzei. Minchat Shmuel 1:11 seems to accept this argument. (4) Additionally, Birkat Hashem (Rav Moshe HaLevi vol 2, 2:40) holds that one should make HaMotzei on sweet challah if one eats a little more than 2 Kezaytim unless it is made with a majority of sweeteners. (5) The Magen Avraham 168:13 holds that all other foods in the food combine with the pas haba bekisnin to establish it as a meal. The Chida (Birkei Yosef 168:6) argues and Sephardim (Kaf Hachaim 168:47) follow the Chida. (6) See Kaf Hachaim 168:45 regarding Shabbat making all Pat Haba Bkisnin hamotzei. The Mahari Chagiz held it did and the Ginat Veradim and Chida who held that it did not. (7) The Magen Avraham 168:44 holds that eggs don't make it into pas haba bkisnin, however, the Kaf Hachaim 168:139 quotes the Dagul Mirvavah and Zera Emet who argue with the Magen Avraham. Halacha Brurah 168:23 rules against the Magen Avraham. ↑ However, Chazon Ovadyah (Brachot pg 55-60) rejects the arguments to be lenient as he holds that all of them are against Shulchan Aruch. Therefore, he rules that a Sephardic guest at an Ashkenazic home that is making HaMotzei on sweet challah should make sure to take with him regular challah in order to make Hamotzei and fulfill the mitzvah of Seudat Shabbat. Halacha Brurah (Otzrot Yosef 8:10) agrees. Sh”t Avnei Yishfeh 3:16 (pg 34) quotes Chacham Ben Tzion Abba Shaul who said that a Sephardi who is a guest at an Ashkenazic home should make Mezonot. This page was last edited on 12 March 2019, at 15:17.